The Center for Digital Engagement: Second Session of Spring Breakfast Series- "The New Face of Branding"
Second Session of Spring Breakfast Series- "The New Face of Branding"
Happy Spring! April has quickly approached, and it's time for our second session of EMU's Center for Digital Engagement Spring Breakfast Series, "The New Face of Branding." 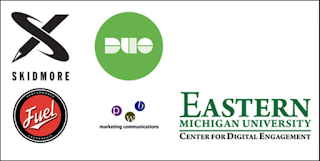 This session will take place on Friday April 7th from 8:00 AM to 10:00 AM at the EMU Student Center. Sign up today! (Registration link). The New Face of Branding will provide insights on how to establish cogent brand strategies for your company in the digital marketplace. Today's digital environment has dramatically transformed the process of building your brand. People consume more video on devices than on TV. They get their news from social media. Add to that time spent gaming and immersed in virtual reality. How do you get your brand message across? How do you get your brand known? For this session, we've again gathered a panel of experts in this space. They have developed highly successful branding strategies for large and small organizations, with regional and national experience developing modern branding campaigns. Some questions you might find them discussing are: What are the most effective modern approaches to branding? What defines your brand as customers explore solutions online and off? What are relevant digital tools and platforms? How do they mix with "traditional" methods?